Full time 2nd grade teacher || Part time Online Health & Fitness Coach & Influencer || Newbie Podcaster|| Lover of all things coffee, giraffes, and Harry Potter || ** RADIATE POSITIVITY - I truly believe I was put on this earth to be a LIGHT, I want to help you all GLOW and radiate that positivity in your daily life. I also know there are tough seasons in life, and areas in which we can always GROW. I look for the Glow & Grow in my life daily and hope this podcast empowers you, inpsires you and helps you GLOW and GROW towards your goals and dreams. This podcast is for my Side Hustlers - Online Influencers or burnt out career women who are looking to make a change in their life. Learn to uplevel you mindset & your life with weekly content on all things time management, personal development, habits, health and fitness and more! Connect with me on: Instagram || @mechaelavardoulakis Make sure to leave a review below & let me know your thoughts & other content you would like to hear from me! Leave a review on my podcast - it would mean the world! ** RADIATE POSITIVITY - I truly believe I was put on this earth to be a LIGHT, I want to help you all GLOW and radiate that positivity in your daily life. I also know there are tough seasons in life, and areas in which we can always GROW. 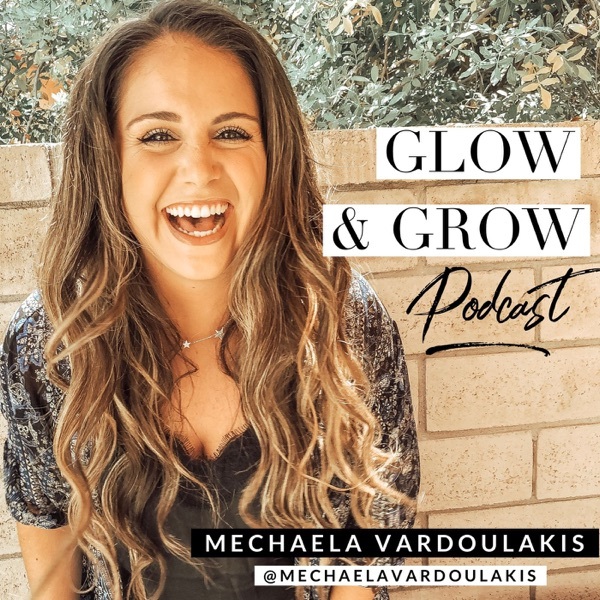 I look for the Glow & Grow in my life daily and hope this podcast empowers you, inspires you and helps you GLOW and GROW towards your goals and dreams. This podcast is for my Side Hustlers - Online Influencers or burnt out career women who are looking to make a change in their life. Learn to uplevel you mindset & your life with weekly content on all things time management, personal development, habits, health and fitness and more! Connect with me on: Instagram || @mechaelavardoulakis Make sure to leave a review below & let me know your thoughts & other content you would like to hear from me! & other content you would like to hear from me! - Do something that makes you happy & will help rejuvenate you! Episode Pauses at 9:17 -9:48 keep listening - it comes back (promise)! - Saying NO to stuff that doesn't serve you. ** RADIATE POSITIVITY - I truly believe I was put on this earth to be a LIGHT, I want to help you all GLOW and radiate that positivity in your daily life. I also know there are tough seasons in life, and areas in which we can always GROW. I look for the Glow & Grow in my life daily and hope this podcast empowers you, inpsires you and helps you GLOW and GROW towards your goals and dreams. Make sure to leave a review below & let me know your thoughts & other content you would like to hear from me!